Love is in the air! Nothings shows you care quite like a collage of favorite photos and keepsakes of your significant other designed with Canva. Relationships come with so many scattered memories. The night sky at the top of the ferris wheel. The label on the orange blossom tea that began each autumn morning together. Save your memories, photos, and thoughts to share with your partner by making a photo collage dedicated to your relationship. From sparkly pink hearts to pictures of mild evening sunsets, Canva features plenty of design elements to complement your hand-picked memories. Whatever the tenor of your relationship, let your love know you’re thinking of them today with a photo collage designed in Canva. 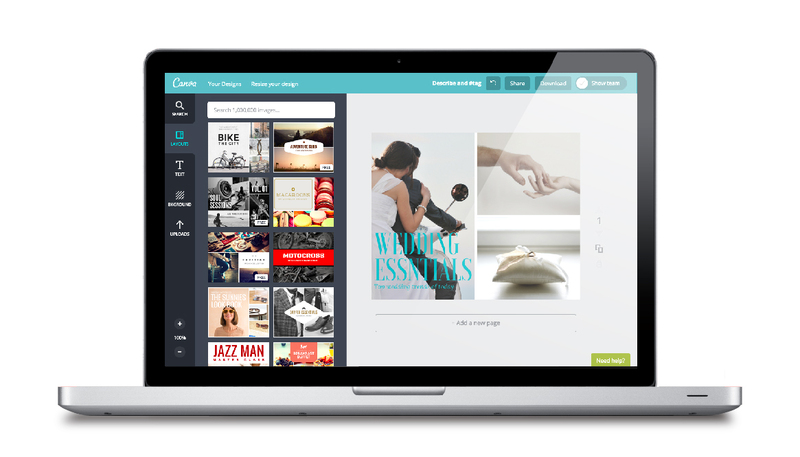 Open Canva and select the “Photo Collage” design type. You can upload all your photos of you and your beau and place them in any design. But why stop there? Let us help tell the story of your relationship with our vast collection of over 1 million stock photos, images, and design elements. Do you and your honey share an inside joke about bananas? Search our library for plenty of fruit to choose from. Did you two meet at a carnival? Search for bigtops and midway games. With plenty of images available for free, and premium photos priced at only $1, you can be sure to honor every quirk and special moment in your photo collage. You’ll never need to worry about the perfect anniversary gift ever again! After you’re done designing your photo collage, you can have it printed three feet high to share with your sweetie. Download your collage as a print-ready PDF and send it to a print professional for the star treatment! Do you want to proclaim your love from the rooftops? Share your collage with the world! Click “Share” to easily post your collage to Twitter, Facebook, or anywhere else that could use some syrupy sweetness. Aside from its snappy, modern design, another advantage your Canva collage has over a shoebox full of photographs and memories is that you’ll never, ever lose your collage when moving apartments. We store all your designs in the cloud, which means you can access and edit them at any computer with an internet connection, or from your mobile devices with our free iPhone, iPad and Android apps. Your memories are with you wherever you travel, so you can continue to build and grow your collage wherever you two go together.